Things are a little calmer this week while everyone is recovering from the last two weeks, so I’m going to pick back up on my PA Anatomy series with the balcony delays. Not everyone likes to sit in the balcony, but it’s generally my favorite place to be these days. The view is usually pretty good, and in the case of my room I think the most comfortable seats are up in the balcony. 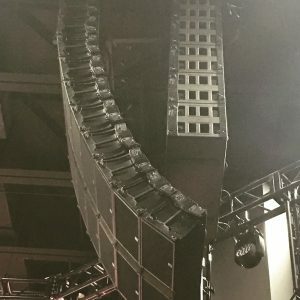 Unfortunately in a lot of venues, the balconies often seem like the last thing to get taken care of for sound reinforcement. 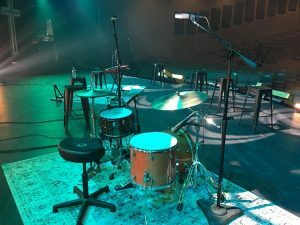 In any sound system design, typically the main seating area gets the most time and attention with the lesser seating areas sometimes suffering. I had a lot of discussions over the last couple of years on what to do with the balcony to make sure we didn’t fall into the same trap. In the traditional, distributed designs I looked at for the room, balcony delays were always a no-brainer; the original system used them, and a new system of trap boxes would need the same. However, line array designs raised some questions due to some challenges presented by the trim height in the room. 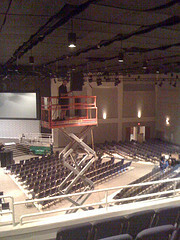 To really make a line array system work in the room, we knew we would need to pull the top of the array right up to the bottom of our lapendary to make sure we could get a long enough line that remained out of screen sight-lines in the balcony and at the back of the room. One of the challenges in doing this is if we wanted to cover the main floor and the balcony with line arrays, we would find ourselves firing at the balcony through a lot of lighting gear which would create high frequency shading in the balcony seats. 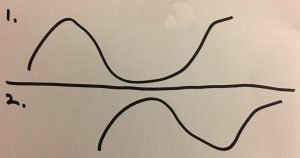 A second challenge would be an increased amount of splay required between boxes in the array to cover front to back in two different listening planes, and we knew that more splay would create less consistent coverage front-to-back in the room. In January of this year, I had a conversation with Dave Hagar while hanging out at Passion that sort of cemented things in my mind on the direction I thought we should go. He suggested we just plan on using balcony delays regardless of what we do for the main floor. This way our balcony would be covered no matter what we do for the main floor which brings us to the photo here that was taken during an initial listening test of a balcony delay to check the box aiming. Pretty much every conversation I had from then on involved using a delay speaker for the balcony. Our balcony delays are comprised of 5 Meyer Sound UPQ-1P’s. The speakers are in single hangs with each one covering a bay in the balcony. The best way I can describe the first time I heard them standing in our balcony is magical, and that was just with an iPod plugged in direct. It was like having a great near-field studio speaker, and I’m looking forward to sitting in the balcony the next time I get to attend. Our balcony seats really are some of the best seats in the house. Do you have any comparison differences between the UPQ’s and the UPA’s? 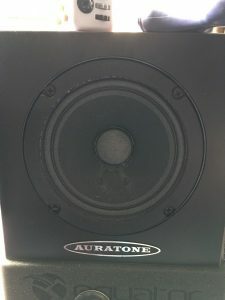 I’ve heard similar things that they sound like “a really big studio monitor.” But haven’t heard the UPQ’s. I don’t believe I’ve ever heard the UPA’s. But they are in the same product line, and Meyer really tries to make all their products work together so I would imagine they have similar characteristics. JB, to answer your question, I toured with the UPA-1Ps for years and I love them, they definitely have the ‘big studio monitor’ feel.